You have just installed new curtains, but the last thing that you want is for those curtains to become dirty quickly. This can happen if people constantly grab the ends of the curtains to open or close them. There is a better solution to this. Use curtain batons or wands to allow for curtains to be opened without hands touching the material. To fit your curtains with a baton, you need to install a master carrier from which the wand will hang. This master carrier should be the last carrier on either end of the curtain track before the end stop. You may also install the master carriers so they meet in the middle of window coverings that consist of two curtain panels. This allows for the curtains to overlap in the middle, preventing light from seeping inside. The type of master carriers you choose will depend on whether or not you want the baton hidden and if your curtains have a stiffener for a master carrier. We have the 84112-P master carrier that requires a stiffener and exposes the baton. There is also the 84114-P master carrier that hides the baton and does not require a stiffener. This shows the exposed baton master carriers that require a stiffener. 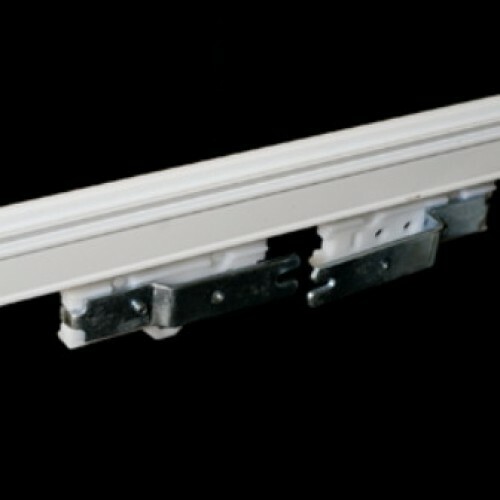 If your carriers require a stiffener, you should get the 84122 curtain stiffener that is compatible with the 84112-P master carriers among other curtain hardware. The stiffener must be used with a separately ordered 84148 shoulder screw. The stiffener is used in the upper corner on the leading edge of the curtain to provide support and enhance appearance. This is the curtain stiffener you need to use with the 84112-P master carriers. If you select a master carrier that has an exposed baton, you should consider the type of wand you get. We have available the 36-inch 84182 white fiberglass baton or the 84184 white fiberglass baton with clip, which is available in 36, 48 or 60 inch lengths. Both of these are opaque batons. They are best to be used when you want the baton readily visible against the curtains or if you are trying to match white curtains or curtain hardware in the room. This is the 36-inch white fiberglass baton. Should your decor require a less obtrusive baton color, consider the 7136 clear acrylic baton. This clear wand comes in sizes 36, 48 and 60 inches. Use this if you would like the baton to blend into the background, if you are using it with a master carrier that leaves the wand/baton exposed. For hidden batons, make your decision based more on the length of the baton rather than the color since you will be less likely to see it.